What a crazy week it has been. In 6 days I have fulfilled family commitments in Johannesburg; co-hosted the movie premiere ‘Little Stars’ as a fundraiser for our work; run a 3 hour workshop in Paarl (nowhere near Durban or Johannesburg); had 12 new patient referrals (all children with serious illnesses) and experienced a ‘smash-and -grab’, losing my handbag, reading glasses (using large font to write this! ), ID, driver’s license and all my bank and store cards. And of course, my window is not standard shape so it is going to take some time to replace. Insert sad face with head in my hands. I have found myself saying when is it going to stop? Just how much crazier can this year get? But the little voice in my head answers me; I think it might be my mother. Julia, things can always get crazier. Just because things are bad doesn’t mean that they can’t get worse. Ask the parents of the children you work with just how much crazier life can get. And as for when does it stop? Right now. It stops right now. I have just been struck by the overwhelming sense of privilege I have. I am sitting on an aeroplane, stuck in peace for 2 full hours, with no cell phone reception. 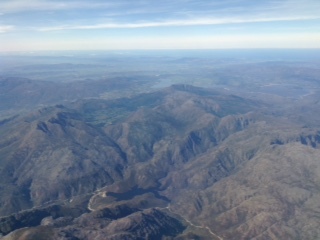 I am high above the earth’s surface looking down on the spectacular glory of the Drakenstein Mountains. I have all this time to reflect on my beautiful life and family. I get to think about how lucky I am to have found my passion. I am not just happy in my work, I am utterly passionate about palliative care for children. Some people work a lifetime and never enjoy their job. And sure, some of you are thinking that I’ve officially leapt off the deep end and it is quite likely that by the time I land, the normal irritations and frustrations of life, especially life at an airport, will have crept back into my blissful existence. But for now, it has stopped. I had a moment, more than a Facebook quote moment. A real moment of happiness and gratitude. How will you find your moment today?